Dua Lipa says she's "proud" of fans after some were forcefully removed from her concert in Shanghai, China. Videos posted on social media appear to show security workers pulling people out of their seats. It was suggested some fans were ejected for waving pro-gay rights flags at the concert on Wednesday. Writing on Twitter, Dua appears to reference this, saying: "I'm proud and grateful that you felt safe enough to show your pride at my show." She added: "I would love to come back for my fans when the time is right and hopefully see a room full of rainbows." Homosexuality isn't illegal in China, although anti-LGBT attitudes do exist and some have said there's a recent trend to sideline the LGBT community. Some social media users have said people were forcibly removed because they were dancing. Others have also said that it was because they were waving pro-gay rights flags. 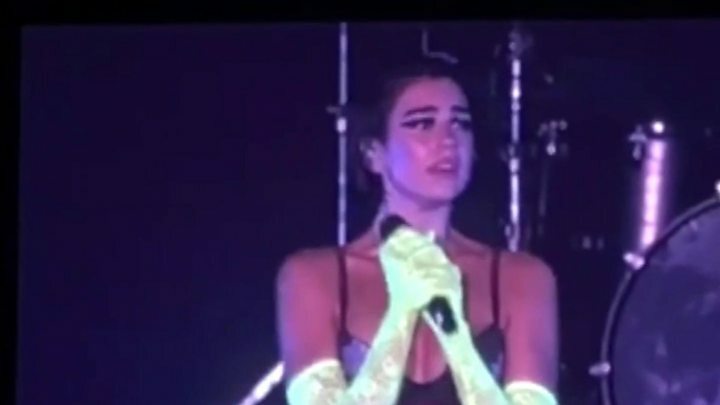 Dua Lipa appeared to get visibly upset during the concert on Wednesday. She told the crowd: "I want to create a really safe environment for us all to have fun. "I want us all to dance. I want us all to sing, I want us all to just have a really good time." She added: "I would love in these last few songs for us to really, really, really enjoy ourselves. How about that?" One woman, who was at the concert with her daughter, told the BBC that people were being ejected "just for standing up"' during the show. She said she saw one incident between several security personnel, the police and a Chinese couple. The man was being held around the neck in a headlock before being removed, she said. She described the police as being "heavy-handed" and "aggressive". It's recently become more common for big names to play in Shanghai. It comes as record labels look to capitalise on a growth in the Chinese music market - despite Shanghai in particular being known as a difficult place to book shows in comparison to other major cities around the world. Before foreign artists can perform there, China's Ministry of Culture runs background checks on artists and their team. In 2006, Jay-Z wasn't allowed to play there because of his "vulgar lyrics" while the Rolling Stones were told to drop five songs - including Honky Tonk Woman and Let's Spend the Night Together - because of references to sexual themes. As more global super stars head to Shanghai with little sign of pre-tour admin being watered down, Dua Lipa might not be the last British export to be greeted with a different atmosphere to what they're used to on the rest of their world tour. This is the first time Dua Lipa has toured in China. She played in Guangzhou and Shanghai. A China representative for Dua Lipa's record company Warner Music Group told the BBC that no-one was available to comment. The singer is scheduled to perform next in Manila on Friday. Follow Newsbeat on Instagram, Facebook and Twitter. Listen to Newsbeat live at 12:45 and 17:45 every weekday on BBC Radio 1 and 1Xtra - if you miss us you can listen back here. Quiz of the Week: But what do visitors see outside Notre-Dame?